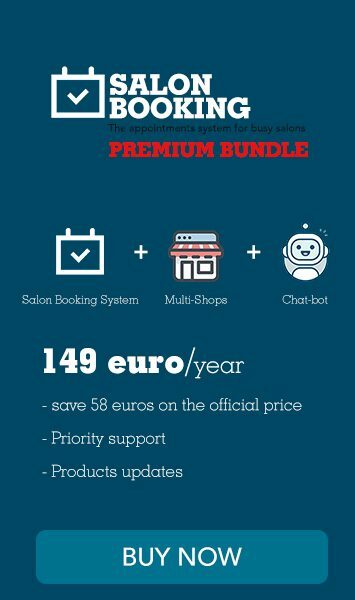 Salon Booking System plug-in is equipped with a set of useful short-codes that will help you implement some important functionalities inside the pages of your website in a very simple way. Let’s see in details which are these short-codes. This short-code is very useful if you want to share with your team or with your customers the upcoming reservations organized by assistant. This short-code has some parameters that allows you to decide which assistants columns to be displayed. Where 3 is the ID of your assistant. By default this calendar is visibile only to your logged in user but we are working to a new parameter that allows you to make it public. This short-code will save you a lot of time on content editing as it will list out all of your services inside the page where you’ll place it. This short-code is like the previous one, it’s a real time saving tool that will list out all of your assistant with relative name, photo, description and skills. Even here you have some parameters to customize the desired output. By default it will show all the information about every single assistant but you can decide which information to be displayed, how many columns and if to use the default CSS style. Do you have any useful suggestion for these short-codes?